These vegan caramels are ooey and gooey, have the slightest hint of cardamon, and are guaranteed to please. With any candy-making, it helps to have a candy-thermometer -- but for caramels, a candy thermometer really comes in handy as there is about a 20 minute cooking time where you don’t stir. During that time you just wait for the candy to reach the proper temperature or the proper “firm-ball” stage. If you're vegan and it has been a while since you have had a good caramel, or the vegan versions are just too pricey to purchase, just make your own! It is totally worth it. I honestly prefer these caramels to any of the store bought, non-vegan versions I remember as a kid. They are the perfect silky, but sticky, texture and they have a nice buttery flavor. First, gather your ingredients and tools. You will need a rather heavy saucepan; make sure that the sides are not too short (at least 6 inches) because the caramel mixture will bubble up high. You will need a wooden spoon. You will also need a greased or silicone loaf pan… I use this size to achieve a thicker caramel, but an 8 x 8 inch pan will also do. Oh, and don’t forget that candy thermometer… clip it on the side of your saucepan. If you don’t have a candy thermometer, have a short glass of cold water in the fridge for a “firm ball” test. Add all the ingredients, except for the vegan margarine, vanilla extract and cardamom into the saucepan. Over medium heat, stirring constantly, dissolve the sugar completely. Next, add your margarine and stir until boiling. Let it continue to boil, without stirring (even the littlest bit), until it reaches 250 degrees on your candy thermometer. A good indicator to test for progress, if you are lacking a candy thermometer, is to take your wooden spoon, and just dip the very tip of it into the top of the bubbly mixture. The syrup should stick to the spoon like a thick pudding when it is about done. 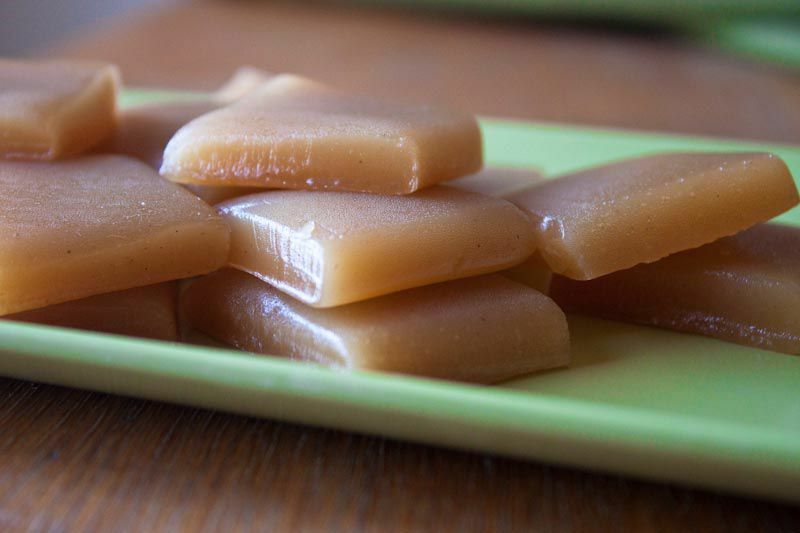 If you think it’s time, take a teaspoon and grab a spoonful of the syrup and quickly drop it into a very cold glass of water, when it is dropped in the water, it should resemble a caramel candy--firm, but pliable. This is referred to as “firm-ball” stage. You will know it is ready when the ball is firm enough not to flatten when you remove it from the glass with your fingers, but it will flatten if you give it a little squeeze. When the mixture is at the right temp, immediately stir in vanilla and cardamom and quickly pour into your prepared loaf pan. Let cool at room temp for a few minutes and then slip into your fridge for about an hour. Once firm, cut them into squares. I like to freeze mine for a few minutes, before cutting, to make them slightly less sticky . Wrap them in waxed paper and store in the refrigerator. They will not melt at room temp (in case you want to give some away), but they get pretty soft if kept in warmer temperatures. Store in a cool dry place up to 1 month. The Best Recipe for Soft, Creamy Caramels!